. Tags: Obama, Second Term President. 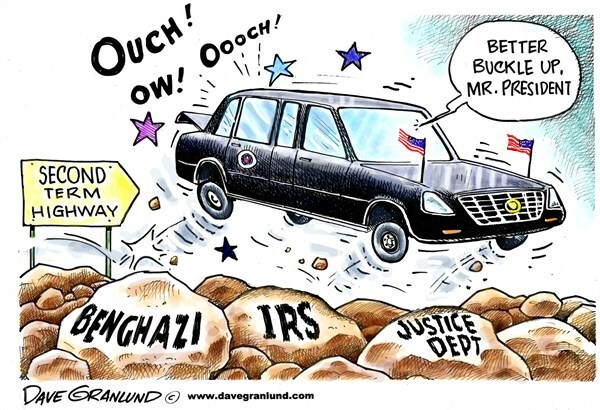 What do you think about the numerous scandals the Obama Administration is facing? 12% - It’s just politics - these things happen to presidents of both parties. 82% - Obama Administration abuses are finally being uncovered. 6% - These are just Republican witch hunts. Almost every U.S. President in recent memory who was re-elected had a dicey second term. Even the venerable Ronald Reagan had his 2nd term issues, like the Iran/Contra scandal. It is now evident that President Obama will not be an exception to this ignominious trend. We wanted to know what our small business audience thought about what has quickly become a trifecta of scandals (Behghazi, IRS, AP/Fox) for the Obama administration, so we asked this question: “What do you think about the numerous scandals the Obama administration is facing?” Less than one-in-five of our respondents attribute Obama’s problems to “just politics,” or “a Republican witch hunt.” The remaining 82%, however, lay the president’s problems at his own feet. You will remember that the Watergate scandal, which was associated with Nixon’s 1972 re-election, ultimately led to him becoming the only president in U.S. history to resign. People called Reagan and Bill Clinton a lot of names, but I don’t remember anyone comparing either one to Nixon. There is one thing that makes Obama’s scandals different from those of Reagan and Clinton - they all seem to be associated with his 2012 re-election. It’s not good news for the president when political thought-leaders and members of the media, including those who are in no way aligned with the Republican Party, have invoked the name “Nixon” or the term “Nixonian” when discussing what we’re learning about the Obama scandals. Amid Reagan’s second term scandal he accomplished many things, including landmark tax reform. Even the Lewinski scandal of Clinton’s second term didn’t prevent him from negotiating landmark welfare reform. Obama’s scandals are serious. But he will not be impeached, nor will he resign. But he has almost four years left on his second term and the more his unfolding scandals sound, smell and/or look Nixonian, the less he will be able to accomplish any of his goals or secure a desirable legacy. Regardless of what has gone before, what will be said about President Obama in 10 or 20 years will depend upon what happens from this moment forward.